An apparent tornado cut through the Tuscaloosa, Alabama, area shortly after 5 p.m. CT (6 p.m. ET). [Updated at 11:41 p.m. ET] Three deaths have been confirmed in Ringgold, Georgia, after severe storms moved through late Wednesday, bringing the five-state death toll from Tuesday night's and Wednesday's storms in the South to 42, according to authorities. In Ringgold, eight people were taken to a hospital, according to Gary Sisk with the Catoosa County Sheriff's Department. There was no word on the severity of the injuries, he said. The town in northwest Georgia was hit particularly hard. One tornado appeared to remain on the ground for at least a mile, said Sisk, adding that some buildings were completely demolished. At least 25 people have been killed in Alabama, including 15 in Tuscaloosa; at least 11 were killed in Mississippi; one was killed in Arkansas; and one other person was killed in Georgia, according to authorities. [Updated at 11:23 p.m. ET] An apparent tornado struck the northern Georgia community of Ringgold in Catoosa County, damaging multiple structures including a hotel, which has collapsed, Georgia Emergency Management Agency spokeswoman Crystal Paulk-Buchanan said. Information on injuries in Ringgold wasn't immediately available. An apparent tornado also was reported in southern Georgia's Walker County, where 30 homes were destroyed, Paulk-Buchanan said. [Updated at 11:02 p.m. ET] Storm-related deaths have now been reported in Tennessee and Georgia, bringing the five-state death toll from Tuesday night's and Wednesday's storms in the South to 39, according to authorities. One person was killed in Trenton in Georgia's Dade County, and at least one person was killed in Tennessee, officials in those state said. At least 25 people have been killed in Alabama, including 15 in Tuscaloosa; at least 11 were killed in Mississippi; and one was killed in Arkansas, according to authorities. [Updated at 10:28 p.m. ET] At least 15 people were killed in Tuscaloosa, Alabama, on Wednesday as severe storms swept through the city, Mayor Walter Maddox told reporters. Statewide in Alabama, at least 25 people in died as a result of storms and tornadoes, the state's emergency management director told CNN Wednesday. At least 11 people were killed in Mississippi and one was killed in Arkansas as a result of the storms. In Tuscaloosa, hundreds of homes and businesses were destroyed, and hundreds more were damaged, Maddox said. Dozens of roads are impassable, he said. Maddox said the city's infrastructure had been "decimated," noting that thousands of residents were without power. Video from CNN affiliates there showed a massive whirling cloud darkening the sky as it approached Tuscaloosa shortly after 5 p.m. CT. The University of Alabama in Tuscaloosa has canceled classes and suspended normal operations for Thursday, the university said on its website. [Updated at 10:17 p.m. ET] At least 11 people were killed in Tuesday night's and Wednesday's severe storms in Mississippi, the state's emergency management agency reported Wednesday. This brings the three-state death toll from the Tuesday-Wednesday storms in the South to 37. In Mississippi, more than 40 injuries have been reported by local officials as a result of the storms, the agency said, and the number of deaths could rise. At least 25 people have been killed in Alabama, and one was killed in Arkansas, according to authorities. [Updated at 8:59 p.m. ET] The death toll from Wednesday's severe storms in the South has risen to 31. At least 25 were killed in Alabama, five in Mississippi and one in Arkansas, according to authorities. Storms packing high winds and the possibility of tornadoes still are bearing down on portions of Mississippi, Alabama, Georgia and eastern Tennessee. "Particularly dangerous situation" tornado watches are in effect for parts of southeastern Mississippi (until 10 p.m. CT); much of northern and western Alabama (until 10 p.m CT); east-central Alabama (until 1 a.m. CT); much of Tennessee (until midnight CT); parts of northern and western Georgia (until 2 a.m. ET); northwestern South Carolina (until 2 a.m. ET); and parts of eastern North Carolina (until 2 a.m. ET), according to the National Weather Service. A "particularly dangerous situation" watch is issued when there is a high risk of multiple strong tornadoes. [Updated at 8:51 p.m. ET] A large tornado is on the ground in Cherokee County, Alabama, about to cross into western Georgia, the National Weather Service said. The city of Rome, Georgia, appears to be in the path of the tornado. [Updated at 8:48 p.m. ET] At least 25 people in Alabama died Wednesday as a result of severe storms and tornadoes, the state's emergency management director, Art Faulkner, told CNN. Regular tornado watches are in effect - expiring at various times tonight or early tomorrow - for parts of Illinois, Indiana, Ohio, Kentucky, West Virginia, North Carolina, Virginia, Maryland, Pennsylvania and New York. [Updated at 7:18 p.m. ET] Authorities in Alabama have received unconfirmed reports of at least 12 deaths as a result of severe storms and tornadoes hitting the state, Gov. Robert Bentley said Wednesday evening. "We don't know exactly yet how many lives have been lost. Unconfirmed, we have at least 12, and possibly 13," Bentley told reporters. "But we will continue, obviously, to find out that number, and we will also monitor the injuries that we have across the state and respond to those." Earlier, authorities said Wednesday's storms killed six people in Alabama. Also killed Wednesday were five people in Mississippi and one person in Arkansas, according to authorities. Hundreds of thousands of people are without power. [Updated at 6:55 p.m. ET] The Tuscaloosa (Alabama) Sheriff's Department is getting reports of major structural damage inside and outside the city limits after a major storm or tornado hit the area less than an hour ago, Sgt. Andy Norris said. The department is getting reports of trees on homes, roofs collapsed at homes and businesses. Many people are calling 911, saying they are trapped, Norris said. The department has not immediately received any reports of deaths. 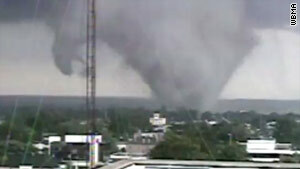 Video from CNN affiliate WBMA showed a tornado hitting the area shortly after 5 p.m. CT (6 p.m. ET). [Updated at 6:47 p.m. ET] A dangerous storm that earlier this evening produced a tornado that moved through Tuscaloosa, Alabama, is heading toward Birmingham, Alabama. A tornado emergency has just been issued for Jefferson County, including the city of Birmingham. [Updated at 6:22 p.m. ET] More information about a tornado that is believed to have struck the northern Alabama community of Cullman this afternoon: A roof was ripped off a courthouse, and a number of residences were pummeled, authorities said. Mayor Max Thompson told CNN it appeared a tornado touched down on the west side of Cullman and then cut through the heart of the city, which has about 15,000 residents. "Downtown was hit pretty hard," said Freddie Day of the Cullman Police Department. He said a number of ambulances had been dispatched throughout the city. It was not immediately known how many people were injured. [Updated at 6:12 p.m. ET] Video from CNN affiliate WBMA shows a large tornado in or near the Alabama city of Tuscaloosa. The National Weather Service has issued a tornado emergency for Tuscaloosa, Ralph, Fosters and Taylorville. [Updated at 5:55 p.m. ET] The National Weather Service has issued a tornado emergency for the cities of Oakman and Parrish in Alabama's Walker County. A large tornado is reported to be on the ground heading for those areas, it said. [Updated at 5:51 p.m. ET] A number of homes and businesses were "hit pretty hard" by a storm that included a tornado in Cullman, Alabama, said Freddie Day of the Cullman Police Department. Damage to the Cullman Regional Medical Center - which emergency management officials had said may have been hit by the tornado - it was confined to the roof, a witness, Summer Frost, said. No storm-related injuries at the hospital have been reported. The severe weather also caused a natural gas line to rupture, though the extent of the damage was not immediately known, Day said. [Updated at 5:37 p.m. ET] A large tornado has been reported five miles southeast of Ashcraft Corner, Alabama, moving northeast at 55 mph, the National Weather Service says. The towns of West Corona, Corona, Gamble and Manchester appeared to be in the direct path of this tornado. The National Weather Service has declared a tornado emergency for New Lexington, Concord and Moore's Bridge. [Updated at 5:04 p.m. ET] WBMA has video of Wednesday afternoon's tornado in Cullman, Alabama. The tornado was believed to have struck Cullman Regional Medical Center, emergency management officials said. Hospital officials declared a "code d" - a disaster - at the facility, a switchboard operator at the hospital told CNN. "Something hit them," switchboard operator Sharon Barnett said. [Updated at 4:46 p.m. ET] The death toll from Wednesday's storms in the South has risen to 12, including six in Alabama, five in Mississippi and one in Arkansas, authorities said. Hundreds of thousands of people are without power. Storms packing high winds and the possibility of tornadoes still are bearing down on portions of Mississippi, Alabama, north Georgia and eastern Tennessee. A number of tornado warnings are currently in effect for parts of Alabama, and emergency management officials believe a tornado struck Cullman, Alabama, earlier today (see below). [Updated at 4:22 p.m. ET] Emergency management officials believe that a tornado has struck Cullman Regional Medical Center in northern Alabama. A switchboard operator at the hospital told CNN that officials declared a disaster at the facility. [Updated at 4:07 p.m. ET] A tornado was on the ground northeast of Cullman, Alabama, as of a few minutes ago, the National Weather Service said. The towns of Good Hope, Baldwin, West Point and Fairview appear to be in the direct path of tornado. A tornado emergency has been declared by the National Weather Service for Alabama's northern Cullman and southeastern Morgan counties. [Updated at 3:21 p.m. ET] The people killed as a result of severe weather in the South on Wednesday include six in Alabama, the Alabama Emergency Management Agency said. [Updated at 1:26 p.m. ET] Two more deaths have been reported in Mississippi as a result of severe weather Wednesday, bringing to 11 the number of people who have died in the South as a result of powerful storms. [Updated at 12:32 p.m. ET] The National Weather Service has issued a "particularly dangerous situation" tornado watch for portions of southeastern Arkansas, northeastern Louisiana and much of Mississippi until 7 p.m. (8 p.m. ET). A particularly dangerous situation watch is issued when there is a high risk of multiple strong tornadoes. [Updated at 12:13 p.m. ET] A total of four people have died in Alabama as a result of severe weather, said Alabama Emergency Management spokeswoman Yasamie August, bringing the total deaths in Wednesday's storms to nine in three states. [Updated at 10:34 a.m. ET] Another round of severe weather was ripping through parts of the South Wednesday, packing several possible tornadoes, killing at least five people and leaving a trail of destruction and damage. The death toll from the storms increased Wednesday. Four people were reported dead in Mississippi after severe weather moved through overnight and Wednesday morning, according to the state Emergency Management Agency. Arkansas officials said earlier one person died there Tuesday night. [Updated at 9:56 a.m. ET] A "heavy rescue" was under way at Lake Guntersville State Park in Marshall County, where a number of RVs were parked at the campground, said Yasamie August, Alabama Emergency Management spokeswoman. There have been no reports of injuries thus far, she said. However, a second wave of storms was approaching, she said. "Major damage" was reported in six counties, and it appears to be more widespread than that from an April 15 storm, August said. Alabama Gov. Robert Bentley's office was getting a state of emergency declaration ready, she said. In Lauderdale County, in far northwestern Alabama, an Emergency Management Agency employee was injured by broken glass after he witnessed what he said was a tornado while in his vehicle near the town of Oakland, the Weather Service said. A window blew out in his vehicle, CNN affiliate WHNT-TV in Huntsville, Alabama, reported. Damage was also reported to a church and a residence. CNN affiliate WBRC-TV in Birmingham, Alabama also reported widespread damage including downed trees, destroyed property and reports of blocked roads. A truck was blown into a ditch on Interstate 22 in Alabama, WBRC reported. Several school systems were dismissing students early or were closed Wednesday because of the weather, The Birmingham News reported. [Updated at 9:30 a.m. ET] Some 269,000 people were without power, most of them in the metro Birmingham area, as of about 8:20 a.m. (9:20 a.m. ET), said Michael Sznajderman, spokesman for Alabama Power, which covers the southern two-thirds of the state. "We're chipping away" at them, he said, but crews may have to pause as the second line of storms approaches. [Updated at 9:15 a.m. ET] Three people died overnight in Mississippi as severe weather swept the state, the Mississippi Emergency Management Agency said Wednesday. Arkansas officials said earlier one person died there Tuesday night. [Posted at 8:30 a.m. ET] A possible tornado has touched down in Marshall County, Alabama, Wednesday and there are reports of people trapped in homes and at a campground, Lee Rosser, a logistics specialist at the county's Emergency Management Agency, told CNN. There are also numerous reports of damage all over the county, Rosser said. CNN affiliate WSFA-TV reported fallen trees and power lines in central Alabama after storms passed through. Several trees have fallen onto roadways, including at least two on the University of Alabama-Birmingham campus, according to WFSA. Also a roof was also pulled off a Birmingham-Shuttlesworth Airport, WFSA reported. Several county schools systems in the state’s midsection closed or delayed opening in preparation for the storms, Alabama media outlets reported. I am devastated at the severity of this Natural Force in Overkill. I only hope Mr. Obama will remember there is a legitimate reason for Emergency Situation to take into effect. How many people were died in Alabama? Mississippi? and Georgia? My my my .........it never matters to people who don't care about others ....... Until when you least expect it....something you are totally unable to control or for see happens to YOU. When Your own life flashes before your eyes in a split second you could be gone or worse you could be rendered helpless among your own kind....those that just do not care! With the death toll rising, is there a way to review a list of deceased, 3 of 5 family members ok. However, Sandy Wallace and her infant are still missing. They live in Tuscaloosa by the campus. No I am looking forward nition accident, but taking into account how you Americans do, and do, the world of evil is only a matter of time until you reach a major accident. What about the people thats their in the prison we a family member their and have not heard anything about those people. My heart goes out to all searching for family members due to the horrific tornado damage, Contact your local Red Cross. If your family member is staying in a shelter or has contacted the Red Cross for assistance they can let them know you are looking for them and can relay a message that they are okay. It takes time. Hope this helps! what was the name of the tornado called? Sorry but whoever the hell wrote this article seriously needs to check their resources.There were over 300 reported deaths in Alabama. I don't know how all these place are only claiming low 30's and 20's for the deaths.I live in Alabama in one of the hardest hit areas, and we were not even reported on the list. News crews and meterologists really need to learn what they are doing before they say that we were not even damaged. Hola! I've been following your site for a while now and finally got the bravery to go ahead and give you a shout out from New Caney Tx! Just wanted to mention keep up the excellent work!